I've always had a bit of a love/hate relationship with David Cronenberg's work. Love, for recognising his ambition and imagination for creating some of the most horrific mainstream films ever seen on the big screen. Hate for the fact he unintentionally scarred me for life with his remake of The Fly. Anyway, since breaking away from the realms of sci-fi/horror he's had a good run in recent years with hard hitting, gritty crime dramas in the form of the excellent A History of Violence and the equally so, Eastern Promises. His latest film A Dangerous Method reunites him for a third consecutive time with Viggo Mortensen and in its own way treads similar themes of past endeavours concerning the body and the mind. It's actually quite sad the film was so subdued because the performances and characters were pretty fascinating. Mortensen's portrayal of Freud was most interesting, a man who loved to look down on all around him. So assured of himself, he was cold and heartless but in his own way longed for some warmth and adoration. Meanwhile Fassbender's Jung was continuously questioning his own ethics and morals, something he developed from the loveless marriage he found himself in with his wife Emma - an extremely tedious, uncharismatic turn from Sarah Gadon. He was silently screaming for a way out, an excuse, a nod of approval from Freud. Something he never received and perhaps contributed to the demise of their friendship - but alas this wasn't explored to its full potential. Special mention must go, however, to the scene stealing and always brilliant Vincent Cassel as Otto Gross, who almost acts as the bad concious to Freud's good concious in Jung's personal conflicts. Keira Knightley has been on the end of a fair bit of abuse over the years, sometimes justified I concede, but I found it comforting to see her attempt a role much more challenging than anything I've seen her in previously. It might not have always the right notes like Fassbender and Mortensen but there were moments of contorted fits which would make a viewer rather uneasy. The production value was unsurprisingly high for a director of Cronenberg's prestige, but I think because of the choppy narrative which only merely gave the odd glimpse into the inner psyches of such complex characters it rarely felt like a truly cinematic experience. It was a film which promised so much from its trailer, and was subsequently so underwhelming. That said, one of the true highlights of the film was the excellent, haunting, atmospheric score from Howard Shore. Though featuring brilliant performances from Mortensen, Fassbender, Cassel and even Knightley, in the end A Dangerous Method didn't turn out to be all that dangerous after all. In a film which initially promised genuine scandal, a dark sexual odyssey and a crazed bunny boiling nut job, it was disappointingly all quite boring and dare I say even pretty safe. 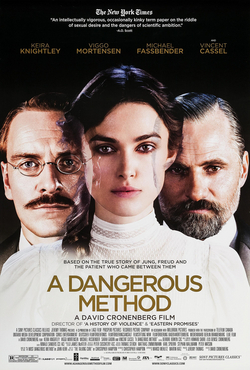 A Dangerous Method is in selected cinemas from February 10th, 2012.